The Utah Jazz just won their Summer League debut 69-59 over the Miami Heat. 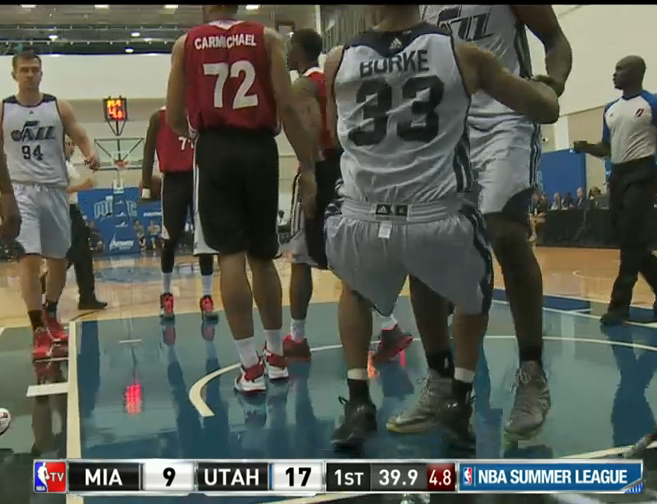 Relevant to your interests is the debut of Trey Burke, seen above wearing his shorts inside out*. Burke played most of the team's minutes at PG (32 of 40; there are four 10-minute quarters in the summer league) and struggled mightily the entire game. He shot just 1-12, scored 8 points (most of which came from the charity stripe where he went 6-8), dished 5 assists to only 2 turnovers, and nabbed 7 rebounds. But immediately evident were Burke's struggles with the speed of the game. Burke shot 0-4** from outside, which isn't too disconcerting. A few of his long balls rimmed out and missing only 3 three-pointers isn't anything to get concerned about. However, his inability to score in the lane or even get off shots proved to be his biggest failing in this game. Burke had two or three shots swatted down, one of them violently from behind when he thought he had a clean fast break pull-up. But all of those circus shots he was hitting during his senior year at Michigan were flying wildly off the backboard as bigger, more athletic defenders were challenging his shots. The other thing that proved problematic for Burke for the first three quarters was an inability to get any separation offensively. In the second quarter, he made a great in-and-out dribble that freed him for a mid-range jumper, but most of his drives to the lane were met with resistance, often forcing him back. Burke's lack of top-end foot speed really showed during this exhibition. Burke had trouble running the offense and getting his players into positions to score. This should be taken with a grain of salt because the Summer League is basically a glorified pick-up game, but more than failing to find his teammates in the halfcourt, Burke seemed to be in a college mindset still when bring the ball beyond the timeline. Burke was frequently stepping over halfcourt as the shot clock hit 16 seconds and the Utah offense wasn't getting started until about 12 seconds left. This is easily correctable and I expect Burke to advance the ball with more urgency in Utah's next game. It wasn't all bad. The Heat were down by double digits for most of the game and extended their defense. They often trapped Burke in the back court or just as he crossed the timeline, and Burke was able to confidently pass out of these traps. Late in the game, Burke was also able to drive and dish to a few of his big men. The Heat were challenging all ball carriers in the lane and Burke finally recognized the help defense, dumping the ball to his teammates for some easy dunks. Summer League ball is sloppy and ugly and generally not indicative of future performance, especially for a PG like Burke who would've had four or five more assists had his teammates hit wide-open jumpers. But this was not a promising start for Burke who was visibly frustrated and struggled in the way that the more pessimistic scouting reports thought he might. *I realized later that all of the Jazz were wearing their shorts inside out, but this still makes me laugh. **It was really 0-3 because of a last-minute heave to end the first half.